Expert mountain climbers know that a river of ice, called the Khumbu Icefall, is an extremely dangerous place to cross on Mt. Everest. Measuring about a half-mile, this constantly shifting glacier has deep crevasses which can open (or close) in a day (or less). George Mallory, the famous British mountain climber, turned away from Khumbu when he saw it in 1921. It was, he said, impossible to cross. Since then, other mountain climbers have successfully conquered the icefall, but the place is more than intimidating. Its overhanging ice can be 10-stories high. Climbers use ropes which can snap and ladders which may not stay in place. After all, moving ice means the ladders have no stable place on which to rest. Glaciers—on the icefall or the Western Ridge of the mountain—can break away at any time. If that happens, avalanches could follow. An avalanche can trigger a catastrophe, with tons of ice set free to harm people. If climbers ascend Everest by means of one of the established routes, they must pass through Khumbu Icefall. It is situated between the Base Camp and Camp 1 on the South Col route to the summit. 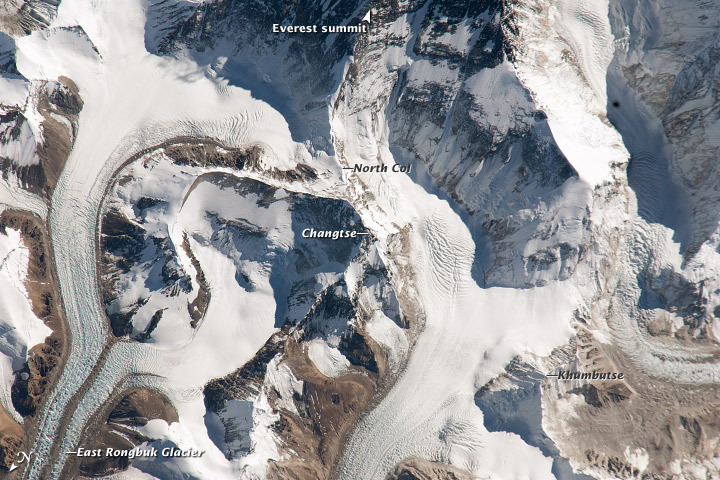 In April of 2014, thirteen Sherpas died in this notoriously dangerous part of Everest (located on the south side of the world's highest peak). Several more were injured, and three were missing (presumed dead), after an avalanche broke loose, falling from the hanging glaciers along the West Shoulder. Eyewitnesses saw the avalanche sweep across the Icefall at around 19,000 feet (5,800 meters), in an area called the "popcorn field” where huge blocks of ice spray across the snow. The Sherpas were ferrying loads, making ready for the client-climbing season, when the disaster occurred. 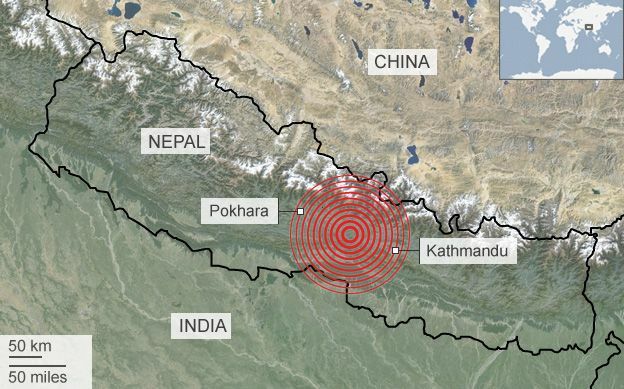 Another disastrous event occurred in April of 2015, when a massive 7.8 earthquake (later updated to 7.9) shook nearby Nepal, triggering an Everest avalanche. This time, even base camp—where climbers feel reasonably safe—was severely damaged. Numerous climbers, in the area, were injured or killed. Sherpas, like the people they help, are at the mercy of the mountain in such situations. Who are the Sherpas? What type of life do they, and their families, lead in the high mountains of the Himalaya? What other types of dangers do they face during the climbing season? When George Mallory climbed Mt Everest, in 1922, he was caught in an avalanche which killed seven of his Sherpas. Two years later, Mallory and his team tried again. He and Andrew Irvine, an Oxford student, set off with five Sherpas. Mallory and Irvine vanished, although the Sherpas were unharmed. No one can be sure whether the two men reached the summit. About 75 years after he was last seen on the mountain, Mallory's mummified body was found. To this day, Irvine remains missing. So is his camera which, if found, could reveal whether the pair reached the top of Everest before they disappeared. Without the help of Sherpas, adventurers would not be able to climb Everest. What is the history of these incredibly skillful guides, and indispensable porters, who risk their own lives every time they tackle the world's highest mountain? Their history, on the south side of the Himalayas, goes back around 500 years. The literal meaning of their name is "people from the east." A nomadic people, they migrated from Tibet to Nepal where four different groups settled near the high mountains. Oral tradition tells us that the Sherpas left Tibet because they were looking for Shangri-la. Most of them are Tibetan Buddhists. Young boys enter the monastic community when they are around 5 or 6. Spending many hours in meditation, they are hoping to find Nirvana. Without roads and trucks, Sherpas procure (and use) building materials by hand. The best Sherpas earn enough money to make their living from guiding clients up the mountain. Others, however, have to work on other jobs (such as finding and carrying stones for building projects). Whether climbing the mountains or remaining in their villages, Sherpas live with extreme weather. Life is hard for these families. To reach school, some of the Sherpa children have to walk 4 1/2 hours round trip. Sherpas breathe more efficiently at high altitude than their climbing clients. At 4,000 feet there is 40% less oxygen than at sea level. This can result in high-altitude sickness, leading to death. Even Sherpas have to get acclimated to the very high altitude. Among other things, Sherpas are extremely hardy. They are high achievers who can push to great heights in a very short time. 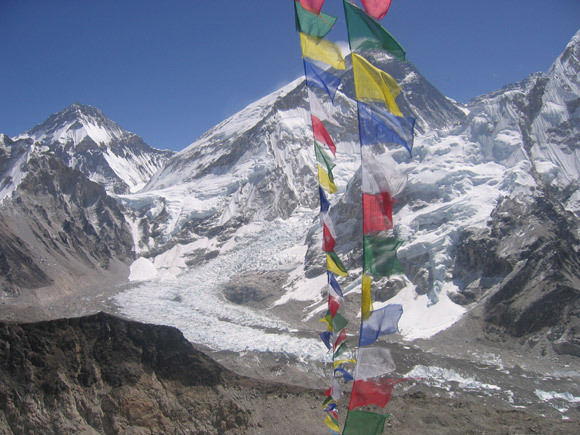 On every Everest climb, Sherpas tie colorful prayer flags along the route. The flags seek divine blessings and bring "good luck" to the expedition. For Sherpas, climbing Mt. Everest is like an expression of their religious beliefs. To reach the summit helps them to draw closer to the five Buddhas who are represented by the prayer flags. In Buddhism, the path to enlightenment requires selflessness and compassion. Sherpas demonstrate those attributes throughout the climbing season as they do their best for their clients. Death on the mountain is not uncommon, even for these highly skilled people. Of the more-than 200 people who have died trying to climb Everest, more than one-third have been Sherpas. During monsoon season, Sherpas cannot climb the mountain. The weather is too bad and, when it isn't raining, the mountain is shrouded in fog. While working away from their villages, the Sherpa guides do not see their families for months at a time. Climbing Everest presents dangers even before anyone reaches the mountain itself. Sherpa clients flying into Katmandu must deal with one of the world’s most-dangerous airports. Sherpas, parenthetically, built that airport. When climbers reach the first Everest base camp, trucks and yaks help to get the supplies to the next stopping point. Enough food for a month is loaded onto the backs of the yaks. Passing impressive ice formations known as seracs which we can view below, the climbers make their way to the next camp. Beyond serving as mountain guides, Sherpas also set up the tents, cook and wash-up for their clients. Between expeditions, Sherpas prepare for the next trip by making sure their equipment is in top-notch condition. Everything, especially the oxygen bottles, has to be secured and in excellent working condition. When everything is in good shape, clients have a good climbing experience. When the clients are happy, the Sherpas can earn a living. Many work at that dangerous job until they are 55 years old. In the recent past, Sherpas have led yearly expeditions to search-for Andrew Irvine's body. It is believed his remains were once seen, near a ridge, in a particularly dangerous part of Everest. Before they set-out on such a journey, the Sherpas meticulously plan their climbing route up the mountain. They must also request, then patiently wait-for, climbing permits from the Chinese government. Sometimes it takes three weeks of base-camp waiting before those permits arrive. With 25 kilos of supplies on their backs, the Sherpas move quickly up the mountain. Searching for Irvine, they climb the North Col because that is the route which Mallory and Irvine followed. 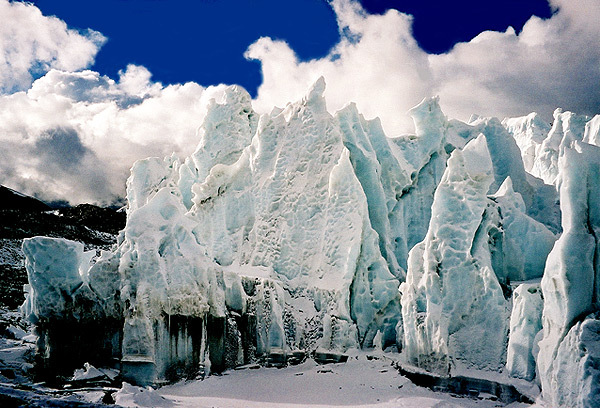 It is extremely dangerous, for many reasons, not least of which are strong gusts of wind, bad storms, fog ... and ... the Kumbu Icefall. When fog couples with wind, the situation becomes even more dangerous. In the "death zone," a group of Sherpas search the ridge where Irvine's remains are believed to be located. Then a storm descends on the mountain, once again forcing them back. The search for Irvine, depicted in this video documentary, ended without finding his body. Although that part of their expedition did not produce results, with every Everest climb, the Sherpas gain from their experience. Because of the avalanche disaster in 2014, the Everest climbing season did not materialize. Sherpas, an indispensable part of the effort, wanted to honor the memories of their lost friends by staying off the mountain for at least a season. Then, during the hiking season along the Annapurna Trail, another disaster occurred in 2014 when snowstorms and avalanches killed more than 39 people while stranding and injuring many more. Of the hundreds who survived the trekking disaster, many needed amputations because of severe frostbite to their limbs. The combination of deadly events caused 2014 to be Nepal's worst-ever year for human exploration of the country's majestic Himalayas. Even well-trained Sherpas cannot always anticipate vicious mountain storms. Because of Nepal's massive earthquake, however, 2015 may prove to be even more deadly for mountain-climbers than the prior year. "Climbing Everest with a Mountain on My Back: The Sherpa's Story," copyright BBC, all rights reserved. Embedded here, via YouTube. Bos, Carole "Sherpas and Their Dangerous Job on Mt. Everest" AwesomeStories.com. Apr 23, 2014. Apr 21, 2019.